The Shimano Mainstream ZE is their top of the line rod. Shimano doesn't have many tenkara rod models but what they do they do well. The ZE is clearly one of the best big water tenkara rods. If big fish - truly big fish - are part of the equation you may want to look at a keiryu rod, but for a true tenkara rod for wider rivers, this is as nice a rod as you'll find. First off, it is a beautiful rod. It wasn't until after I had returned the one I had borrowed that I realized I hadn't taken any photos of the rod other than the bend comparison below, which does not even come close to showing how nice the rod looks. The first thing you will notice with this rod (after getting over it's looks, that is) is that it is a relatively stiff rod. The upper photo (above) shows both the Shimano Mainstream ZE and the Tenkara USA Ito at their shorter 4m setting. A photo of the two rods at their extended 4.5m length looks virtually identical. Perhaps the one thing anglers have asked for more than anything else with respect to the Ito is for it to be a bit stiffer. The Shimano Mainstream ZE is clearly a stiffer rod than the Ito. What many have wanted, but either have been to shy to ask for or didn't realize it was possible, was for the Ito to be quite a bit lighter. The ZE is lighter - a lot lighter. It is just 3.2 ounces, nearly a full ounce lighter than the Ito. I took the photo above after I had fished with the rod, and I was surprised to see how stiff it is. The Shimano Mainstream ZE does not feel that stiff while fishing. It feels very crisp, and much more like a fly rod than what I have come to think of as how a tenkara rod feels. Part of that difference can be explained by the difference in the tip section. The Shimano Mainstream ZE has a hollow tip section. Most other tenkara have solid tips, which are much more flexible. On the one hand, this allows you to make pinpoint, tight loop casts. On the other hand, you do sacrifice the deep bend that even a modest fish will put in a softer rod. The photos above show how much the rods bend under the weight of 10 pennies (25 grams). I would guess that is roughly the bend you'd see from a 7" trout. A fair amount of the commentary surrounding the Shimano Mainstream ZE on the various US tenkara forums centers around whether it would be a good choice as a "big fish" rod. I guess I should say first that I don't really see tenkara fishing as being a big fish pusuit. 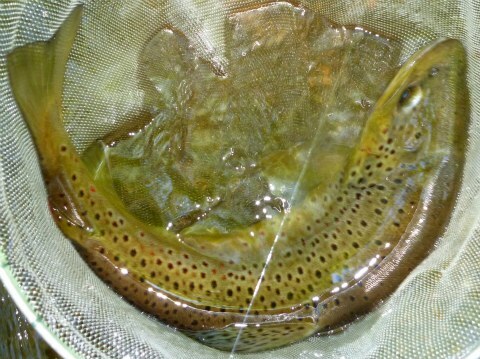 However, many of the rivers that are large enough to want a 4.5m rod have big fish in them. And if there are, eventually you'll catch one. If you look at other pages on TenkaraBum.com, you'll see photos of fish larger than this taken with rods softer than this. I really don't think you need a stiff rod to tire a large fish. You will have a bit more control in trying to keep a big trout out of the current or a big bass out of the brush, but the difference will not be large. I will say, though, that because of the length and stiffness of ZE, it does do well for big water. I don't particularly like fishing with a long line, but some do, and this rod will certainly handle it. In fact, I suspect it was even designed for it. Dr. Ishigaki demonstrated casting with a 7 meter line in the Catskills on the Willowemoc River and a 9 meter line in San Francisco on the pool at the Golden Gate Casting Club. And if you think you need to be a tenkara master to do that, think again. One of the members of the Golden Gate Casting Club, after taking a few modest practice casts to get the feel of the rod, started booming out 40' casts as if he'd been fishing the Shimano for years. (Rod + line + tippet. He was not stopping the cast with the rod still high, as you would when fishing - he was casting for distance.) It's mostly getting a feel for how (and when) to load the rod and then letting the rod propel the line. And while the rod will cast the size 3 Hi-Vis Fluorocarbon, it seems more at home with the size 4. As with the long line, I suspect it was designed to cast a size 4 line. One other thing that surprised me about the Shimano Mainstream ZE, after having fished with the Tenkara USA Ito, is how the rod feels when fully extended. 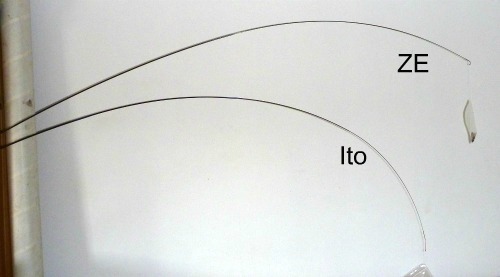 The Ito is a soft rod, and when fully extended feels even softer. The Mainstream, perhaps because it is so much stiffer, did not feel like it got softer at full extension. The Ito almost feels like two rods in one, the Mainstream feels like the same rod, only longer. I am not a rod designer, but I suspect that the goal of achieving that uniformity of feel is what led them to make a rod that only collapses to a very un-tenkara-like 35 1/4 inches. (I need to rephrase my earlier statement. The first thing you notice about the ZE is not it's stiffness. You'll notice its surprisingly long collapsed length before you even take it out of the package. Thirty five inches for a collapsed tenkara rod is LONG!). For a long time, the collapsed length pretty much turned me against the rod, but realistically, you need the short collapsed length mostly for backpacking or hiking in to smaller streams. Many of the "main streams" that this rod were designed for are going to be along roads. If you are not hiking in, a 35" collapsed length is no big deal. It is still shorter than many broken down fly rods and is quite a bit shorter than my wading staff, which I have with me all the time when fishing. I was a bit surprised at how much I liked the Shimano Mainstream ZE when I got to actually spend some time with one. I had cast Dr. Ishigaki's twice before - for just a few casts in the Catskills and a bit more in California, and I had already decided that I didn't particularly like it. To be fair, both times he had a line on the rod that is much longer than I ever fish with and much longer than I like. The rod was also a bit stiffer than the 5:5 rods I was used to at the time. The rod also felt a little loose, perhaps, as if the joint that holds the zoomed section had worn. The rod I borrowed, in comparison, felt quite snug. If you are looking for a big water rod that is capable of casting a long line and easily handling 18" fish (although I can't vouch for 24 inchers), and if you do not have to backpack in to the rivers you fish, this is a rod that deserves serious consideration. The Daiwa LT44SF and Nissin Air Stage Honryu 450 are also big water rods. The Daiwa is much beefier, and with a penny rating of 33 is a better choice for a big fish rod than the Shimano or the Nissin. The Nissin is lighter at just 2.9 ounces, but it's collapsed length is even longer at over 40". It's penny rating is similar at 20.5 pennies, compared to 22 and 21 for the Shimano (at 4m and 4.5m, respectively). The Shimano Mainstream ZE has the muscle to subdue nice fish, is a nicer rod (from a fit and finish standpoint) than the Nissin, and gives you the option to fish it at 4m as well as 4.5m. That makes it a pretty compelling choice for someone looking for a top quality big water / reasonably big fish rod. I do not have one in stock but I could order one for you. The rod would be about $350 with $12 shipping.